It is impossible to grasp the historical ramification of the youth march to the U.S. political stage in 2018 without an overall view of the world political situation. The American youth with their impressive “March for our Lives” in millions- in 800 cities throughout the United States- broke the barrier for “CHANGE” that their parents had been struggling with for decades. 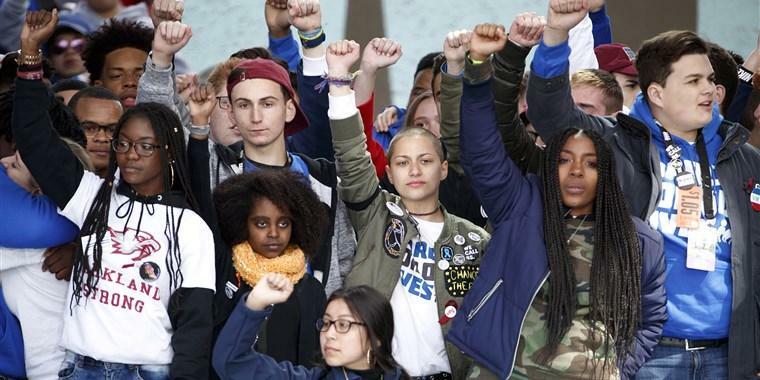 Politicians in Washington were surprised and scared (at the same time) of the genuine and powerful messages that they heard from the young speakers (as young as 9) at the march – just a few feet away from their offices! The immense waves of ENERGY and POLITICAL MILITANCY of the youth felt like a tsunami to these old, corrupt politicians. For these ladies and gentlemen in Washington, the chant of “Vote Them Out!” was too real to ignore. It seems the world was waiting for the American Youth to shout: “Enough Is Enough”. This march divided Americans into two distinctive forces; one that seeks an end to Violence and the other which promotes War and more Violence. This clear division already has become a major problem for the 1% in the U.S.
Before we get to the real challenge of the American Youth Leadership, let’s talk about the “MEDIA”. For the sake of time, let’s see how CNN (the official Warmonger Channel) has covered this march. Well they did their best; they covered the march “live” -unlike Fox News- but at the same time through their robot Pentagon reporter Barbara Star- they “assured” us that the U.S. generals in their deep bunkers are ready to fight Russians at any time and moment! The challenge for the American youth today is to stay away from the Democratic Party – in any form and shape. A force independent of Democrats, Republicans and other 1% representatives is the only path for change. It is important to realize that today; “Dems” (as they are called) in general -more than ever- are the main political hurdle for progress and change.